Analysis of the oldest reported trace of human faeces has added weight to the view that Neanderthals ate vegetables. Found at a dig in Spain, the ancient excrement showed chemical traces of both meat and plant digestion. An earlier view of these early humans as purely meat-eating has already been partially discredited by plant remains found in their caves and teeth. The new paper, in the journal PLOS One, claims to offer the best support to date for an omnivorous diet. Poo is "the perfect evidence," said Ms Ainara Sistiaga, a PhD student at the University of La Laguna on the Canary Islands, and the study's first author, "because you're sure it was consumed". 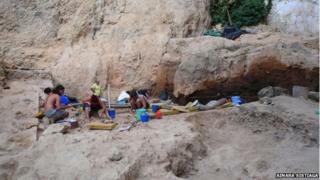 Ms Sistiaga and her colleagues collected a number of samples from the remnants of a 50,000-year-old campfire in the El Salt dig site, a known Neanderthal habitation near Alicante on Spain's Mediterranean coast. A year later, the samples were analysed in a lab at the Massachusetts Institute of Technology (MIT), where Ms Sistiaga is a visiting researcher. The team used a technique called gas chromatography to separate the chemicals bound up in the ancient samples. This was combined with mass spectrometry to figure out which molecules were present and in what quantities. Importantly, the relative concentration of an ester called coprostanol - used to detect human sewage - suggested that several samples were in fact traces of fossilised faeces. The faecal matter came from the very top layer of the fire remains. Ms Sistiaga explained this probably means it was left behind after the fire was extinguished, perhaps on the periphery of another nearby campfire. "The fire was not active at the moment of the deposit - it makes sense," she said with a chuckle. In thin sections of soil from exactly the same area, the team also identified small "coprolites" - whole pieces of fossilised poo - which showed characteristics of human faeces, including their physical structure and a high phosphate content which makes them glow under blue light. Dated at about 50,000 years old, based on the layer in which it was found, this is the oldest human excrement ever identified. Ms Sistiaga said her samples easily pre-date other fossilised faeces, belonging to modern humans (Homo sapiens) and found in Egyptian mummies and ancient Greek latrines. The key finding, however, came from the chemical make-up of the miniscule traces of faeces in the campfire ashes. All these samples were dominated by products of meat digestion, but one in particular showed significant amounts of plant-derived esters as well. So although the Neanderthal's predominant food source was meat, Ms Sistiaga explained that the chemistry of her sample suggested a "significant intake of plants". "If you find it in the faeces, you are sure that it was ingested," she told BBC News. "This molecular fossil is perfect to try to know the proportion of both food sources in a Neanderthal meal." Based on the history of the area, the vegetable matter that supplemented these ancient humans' mostly meaty diet could have been a mixture of berries, nuts and root vegetables. Dr Stephen Buckley is an archaeologist at the University of York, who has previously reported evidence of plant matter in the dental tartar of Neanderthals - some of it cooked, and some of it possibly medicinal. He described the new research as "something new and different" and a "hugely welcome addition" to the question of Neanderthal diet, which remains controversial among scientists. "The start point, the teeth, and the end point, the faeces, show the same thing," Dr Buckley told the BBC. "The evidence is clear at both ends, if you like." "It will be much harder, now, for people to dig their heels in and try to argue that Neanderthals just ate meat and not plants to any degree." He added that their diet probably varied depending on where they lived. "If you're in central Germany, it might make sense to eat more meat - the climate is cold, and you need more calories. But if you're in Spain, where there was a milder climate, then there might be more of a reason to consume plants." Diet has been suggested as one of the reasons for the Neanderthals' extinction, some 30-40,000 years ago. As meat-eaters, the explanation goes, they were out-competed by the more adaptable Homo sapiens. "Increasingly, it's obvious that the picture needs to be revised," Dr Buckley said. Ms Sistiaga agrees: "We believe Neanderthals probably ate what was available in different situations, seasons, and climates," she said.